Looking for a healthy way to kickstart your summer? Be a part of the largest yoga event in Upstate NY by coming out to the NYS Yoga Festival June 9th at Letchworth State Park! The event, put on by Hikyoga, features yoga in an outdoor atmosphere. For those of you already aware of Hikyoga, I don't need to tell you how exciting of an opportunity this is. For those of you unfamiliar, I feel like I need to take this time to explain the amazing concept behind welding nature and yoga into one. Hikyoga was founded in 2015 by Nicole Kazimer as she began teaching yoga to her friends in the parks near Rochester, NY. Soon, her friends brought friends, then friends of friends, and she noticed the opportunity to create something great. Nicole realized just how much people loved being outside (especially in NY where you're cooped up six months of the year, can you blame them?! ), and decided to incorporate more hiking into her yoga classes to explore the beautiful trails of Upstate. I will admit, if there's one thing I miss about living in Cuse, it's the endless hiking opportunities. It just so happens that soon after, Hikyoga was born, infusing hiking and yoga- two things that Nicole is passionate about- into one. Kazimer has decided to take that passion one step further with this year's NYS Yoga Festival. Why not take a Saturday for yourself to enjoy the great outdoors, either on your own or with a friend? The event gives people the opportunity to slow down and enjoy the little things, bringing us back to our very foundation. So what can you expect at the event? Of course, the Hikyoga team will be leading Hikyoga classes throughout the day, with separate opportunities to join in on a more intimate session to explore the park and check out the incredible views of the "Grand Canyon of the east." You do not need to join this class to check out the trails.. feel free to grab your friends new and old and explore! If you're not a hiker, classes will be also offered at the mainstage between 10:30 and 4:30, with a closing meditation with Erica Ebert at 5 p.m. that you won't want to miss! Also a certified Hikyoga instructor, as well as owner and founder of Balance Yoga in Webster, NY, Erica holds much the same mentality about the importance of yoga/meditation. Erica loves the energy of practicing in the community, and is excited about what including such a large community of practitioners will bring to an event like this. When asked what she is most looking forward to about the event, Erica said, "I'm really looking forward to facilitating the meditation. It's a safe place to practice physically and emotionally; it allows us to experience both comfort and discomfort and breathe deeply into all of it." This event is special because it will include so much more than just yoga! Relax and enjoy some lunch to the music of singer-songwriter, Kevin Paris. Attend a workshop to dig a bit deeper into your own wellness. Browse among over 30 vendors including local artisans and entrepreneurs as well as mainstream brands such as Athleta, Young Living, Lululemon, REI and more. There's even a children's yoga session for the kiddos! With the idea that we can each create our own experience, the event is truly an all-encompassing day to celebrate emotional and physical wellbeing. 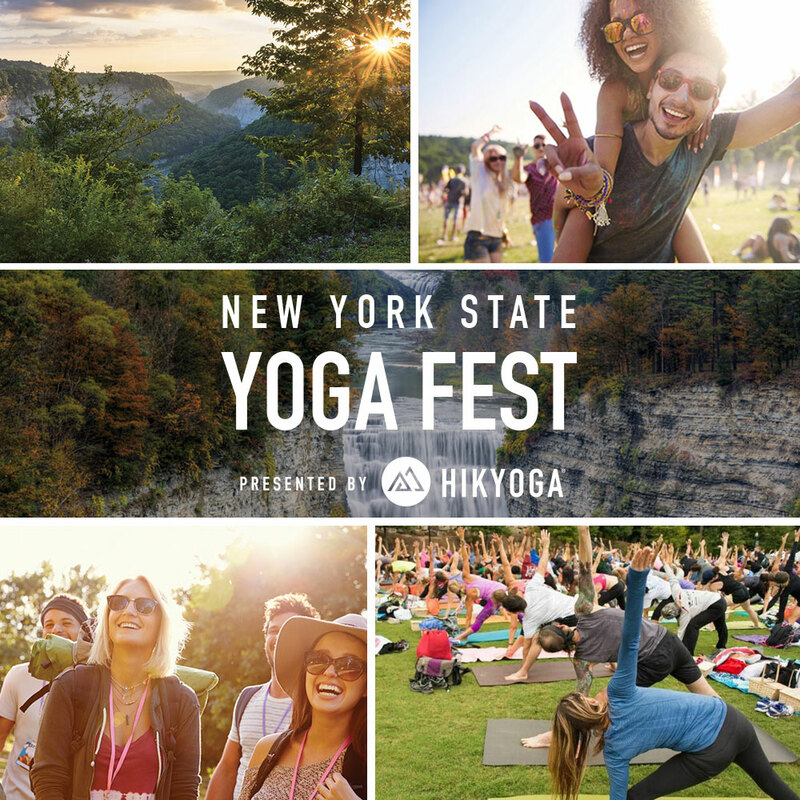 "Being from Upstate NY, it is so exciting to me to share such a wonderful event showcasing how gorgeous our state is, while enhancing the experience with yoga. I am so excited to see our community come together to celebrate nature, enjoy yoga and share positive vibes with each other. When hosting feel-good yoga events, my favorite part is hearing people say that it is just what they needed, and leave feeling refreshed and grateful that they made the decision to take care of themselves for the day." I just had to include this quote from Nicole, because I love it so much. It's so true- when I think back to my journey in yoga, and how it has grounded me so much in this past year, a certain part of growing in the journey includes forming these relationships in the community, and having a sort of support team. Make the conscious decision this June to do something for yourself, and join in the fun of the NYS Yoga Festival!